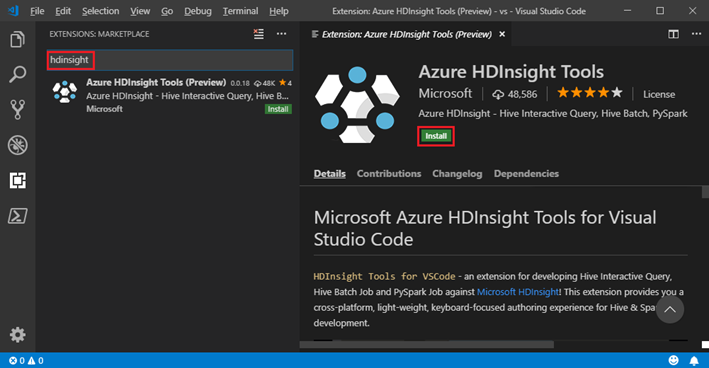 We are pleased to announce the general availability for Azure HDInsight Tools for Visual Studio Code (VSCode). HDInsight Tools for VSCode give developers a cross-platform lightweight code editor for developing HDInsight PySpark and Hive batch jobs and interactive query. For PySpark developers who value the productivity Python enables, HDInsight Tools for VSCode offer a quick Python editor with simple getting started experiences, and allow you to submit PySpark statements to HDInsight clusters with interactive responses. This interactivity brings the best properties of Python and Spark to developers and empowers you to gain faster insights. For Hive developers, HDInsight tools for VSCode offer great data warehouse query experiences for big data and helpful features in querying log files and gaining insights. First, install Visual Studio Code and download Mono 4.2.x (for Linux and Mac). Then, get the latest HDInsight Tools by going to the VSCode Extension repository or the VSCode Marketplace and searching HDInsight Tools for VSCode. If you have questions, feedback, comments, or bug reports, please send a note to hdivstool@microsoft.com.